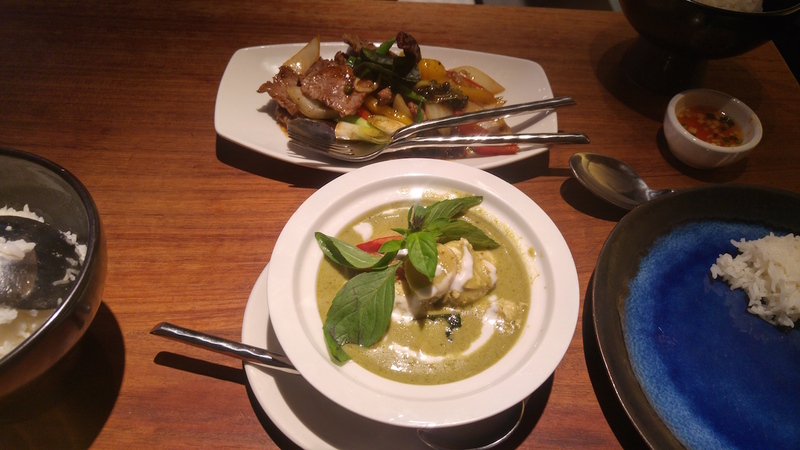 Patara is a Thai Restaurant in Berners Street, just off Oxford Street that offers up Thai food in a fine dining environment. The venue is spacious and was not that busy as you can see from the above photo, but the decor and service is that of what you would expect of a find dining establishment. There were 2 different lunch menus, remember to ask for it when you sit down! One is the £9.90 the other a £14.95 option. There was not that much choice from the menu to be honest, but opted for teh starter of the day – ONE single lonely stick of chicken satay and the green curry. 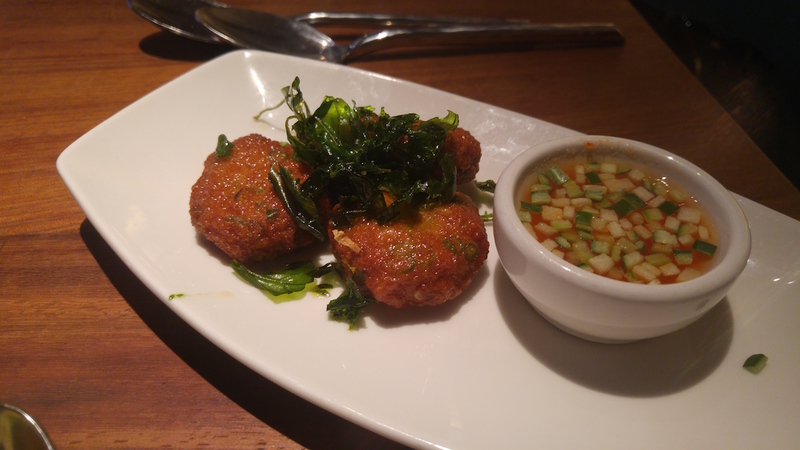 My friend got theSpiced fish cakes with cucumber salsa and Stir-fried beef noodles with bell pepper in black pepper sauce. The massive(!) portion size is what you expect i guess from a fancy fine dining place, regardless, it was great, cooked so it was soft, tender and juicy. Needed more peanut sauce me thinks. The curry came with rice. 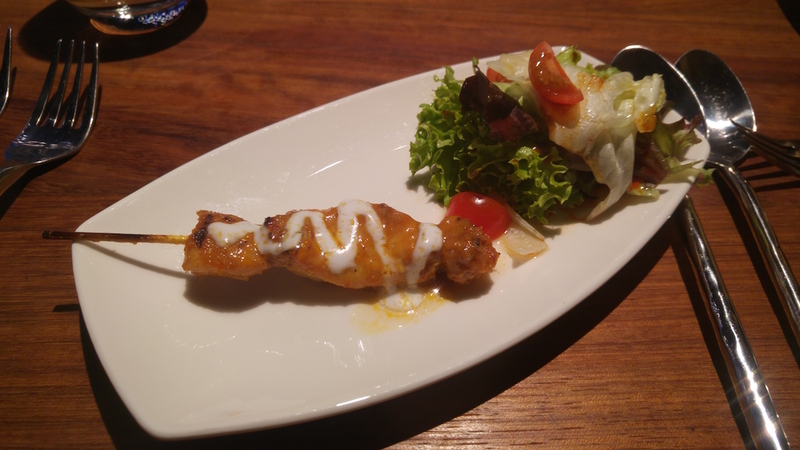 The chicken like with the satay was cooked really well, very juicy for a curry dish. The curry itself was okay, very middle of the road, nothing special. 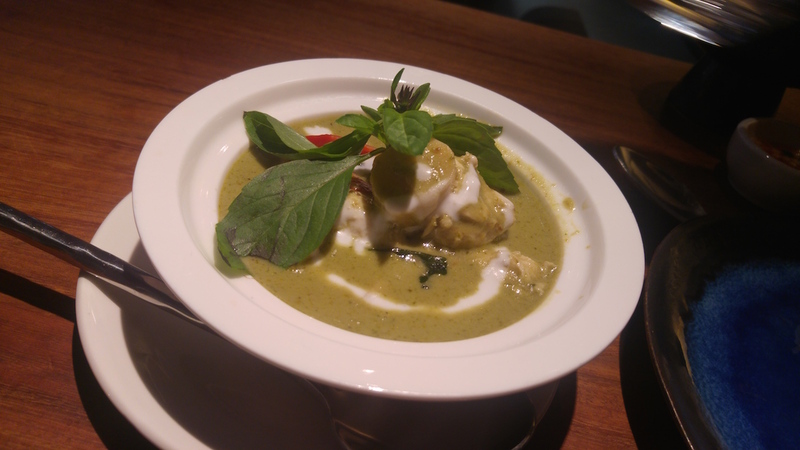 Not really fair to “review” a place based on a small amount of dishes, but for fine thai dinning in London for lunch its good, the A La carte menu is a lot pricier! Pork and Alcohol on menu. Hey Buddy!, I found this information for you: "Patara". Here is the website link: http://halalfoodguy.co.uk/patara/. Thank you.